The Foothills Art Festival draws approximately 100 artists and over 500 works of art each October. The Foothills Art Festival is a long standing tradition held within the foothills of Southeastern Ohio and is made possible by the generosity of arts supporters. A project of the Southern Hills Arts Council, the festival draws approximately 100 artists and over 500 works of art each October. The festival is held in the main lodge at Canter’s Cave 4-H Camp outside Jackson. 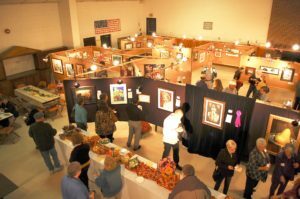 The 37th Annual Foothills Art Festival will be held Friday, October 12 through Sunday, October 14, 2018 at the indoor lodge at Canter’s Cave 4-H Camp, 5 miles northwest of Jackson, Ohio. Hours are Friday and Saturday, 10:00 a.m. to 7:00 p.m., and Sunday 12:00 p.m. to 5:00 p.m. A Preview Reception will be held Thursday evening, October 11, as a chance for the press, volunteers, and artists to mingle with the buyers. Visual and hands-on arts activities will be presented free throughout the weekend. The Foothills Art Festival was originally started in 1981 by Jeanne and Louis Jindra at The Winery on Camba Road. The festival continued at this location, first inside the winery and later in two huge tents on the winery’s grounds, until the winery closed and the event moved to its current Canter’s Cave location. In 1985, Southern Hills Arts Council assumed sponsorship of the festival. Artists are invited to exhibit in the following categories: Oil/Acrylic, Pastel/Drawing, Traditional Photography, Enhanced Photography, Three Dimensional Work, and Watercolor. The exhibit is professionally judged, but is not juried. Artists of all ages and experience are encouraged to enter. A total of $1,545 will be awarded in prizes, sponsored by local and regional businesses. Entrants are limited to four works per category. 2017 Entry Form: Foothills Registration Form rev 17 letter. Please stay tuned for a 2018 form. The registration deadline will be September 5, 2018. 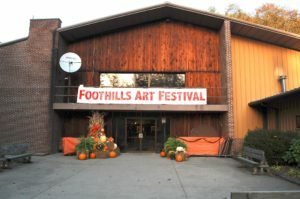 The Foothills Arts Festival is held in the main lodge at Canter’s Cave 4-H Camp, 1362 Caves Road in Jackson, Ohio. For further information about the 35th Annual Foothills Art Festival, please call the Southern Hills Arts Council at 740.286.6355, email foothills@markayjackson.org or write P.O. Box 149, Jackson, Ohio 45640. Find us on Facebook at www.facebook.com/foothillsartfestival.